The Army said on Saturday that the breakthrough was recorded during an operation in Borno State. A total of 84 persons held hostage by the insurgents at Camp Zairo were rescued by the troops and have been handed over to the Borno State Emergency Management Agency (SEMA). The Theatre Commander of Operation Lafiya Dole, Major General Rogers Nicholas, that some of the women rescued were found to be pregnant while the children among them looked malnourished. The 84 persons were flown by the Air Component of the Operation Lafiya Dole to Maiduguri, the state capital after being freed from the heavily guarded camp. Major General Rogers Nicholas, who handed the victims over to SEMA, said most of them are tasting freedom for the first time in about three years after their abduction. 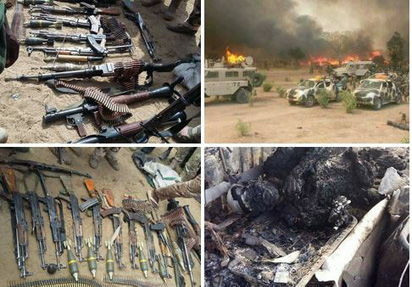 The Nigerian Army has revealed another breakthrough recorded during an operation in which a military tank and other weapons were recovered from the Boko Haram terrorists in Borno State. A total of 84 persons held hostage by the insurgents at Camp Zairo were rescued by the troops and have been handed over to the Borno State Emergency Management Agency (SEMA). The Theatre Commander of Operation Lafiya Dole, Major General Rogers Nicholas, disclosed this on Saturday to reporters in the state. According to him, some of the women rescued were found to be pregnant while the children among them looked malnourished. The 84 persons were flown by the Air Component of the Operation Lafiya Dole to Maiduguri, the state capital after being freed from the heavily guarded camp. Major General Rogers Nicholas, who handed the victims over to SEMA, said most of them are tasting freedom for the first time in about three years after their abduction. At least 26 Boko Haram members surrendered to the military authorities in Damboa Local Government Area of Borno State earlier in the week. The ‘repentant’ terrorists were paraded on Friday in Maiduguri, the Borno State capital after they were quizzed by the military. They were said to have surrendered last week and turned over their arms and ammunition including RPGs, after which they were taken to Maiduguri for deradicalizsation. More than 2300 fighters have surrendered in the last 13 months following intensive military action and seizure of the Sambisa forest, the main enclave of the insurgents. More than 25,000 people have been killed in the insurgency since 2009 and at least 2.4 million Nigerians displaced in the northeast states of Adamawa, Yobe and Borno. Meanwhile, the Army has confirmed it would conduct more exercises in 2018 to assist civil authorities to deal with internal security challenges in parts of the country. The Chief of Army Staff, Lt.-Gen. Tukur Buratai, said on Friday after leading troops on a 15km Route March. Buratai said exercises `Harbin Kunama III, Crocodile Smile III and Egwu Eke Dance III would also be conducted in 2018. Exercise Harbin Kunama I and II were conducted in 2016 and 2017, respectively, to deal with the menace of cattle rustling and herdsmen/farmers clashes in parts of North-West and North-Central.